I decided over the last couple of weeks that my scraproom needed a makeover. I wasn't feeling inspired in there and decided that maybe a change would help me. Cindy loved Tinkerbell (truthfully, so did I) so I decided to start with that. I'm happy with it so far. Still have some things that I need to do but it's coming along. 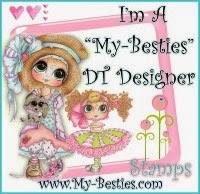 A new card ...A bestie for a bestie.